When it comes to excellent debut albums, bands such as Van Halen, Sonata Arctica, and Metallica often come up in conversation. 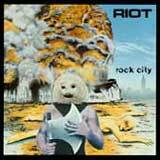 However, Rock City by Riot seems to be largely overlooked. Perhaps this is due to the band's true emergence in the 80's with the wildly successful Fire Down Under. Furthermore, the one thing that has been constant about Riot over the years is change. Nearly each studio album saw some sort of lineup change of some sort, and the band has seen four difference lead vocalists over the years. With Mike DiMeo recently departed for Masterplan, Riot is destined for yet another lead vocalist. With all the different Riot material from different eras to choose from along with Fire Down Under dominating the Guy Speranza era of the band, their outstanding debut album seems to easily get lost in the pack. Consider this review my nomination for one of the best metal debut albums. Rock City is raw, in your face slab of heavy metal fury. The polished production and keyboards found on later Riot albums is not yet present. What we're left with is a very raw and energetic album that just screams of a young band that is eager and highly motivated to get their music out to the people. This is one of those debut albums where the chemistry of the band is perfect, and all cylinders are firing in perfect synchronicity. Peter Bitelli does a fabulous job behind the kit creating a pounding wall of sound throughout the album. Repetitive fills and lazy, unimaginative drumming are nowhere to be found here. If Red Bull were around in the 70's, I speculate that Bitelli downed a few of these before entering the srudio. A fury of cymbal crashes, and constantly varying drum beats keep the listener on his toes throughout the album. This element of the sound truly serves as the wheels for the freight train of sound that is delivered. This album also showcases some of Mark Reale's most unrestrained and flamboyant work to date. Rock City is loaded with tantalizing solos and persistent shredding. For those of you who like loud guitars, you'll find plenty of that here. Although Riot really is Mark Reale's band, he never allows the integrity of the individual song to be sacrificed in the name of showing off his guitar skills. I hear a lot of youthful energy and big guitars on this album which would become a staple of the NWOBHM scene that was about to burst in a couple short years. Vocalist Guy Speranza also had an energetic charisma that reminds me a lot of the NWOBHM scene. With all the busy guitar work and drumming behind him, Speranza's voice really fit this early Riot work like a glove. His raw energy combined with a sense of melody was a highlight for Rock City and the other two Riot albums that he sang on. The songs themselves are each memorable in their own rite, and there is a certain degree of diversity to be found. Although this album was recorded from November 1976 - June 1977, Warrior can almost be labeled a power metal song. To this day, Warrior is one of my favorite Riot tracks, as well as one of my favorite metal anthems, period. Desperation, Overdrive, and Angel are typical of the melodic heavy metal that makes up the majority of the album. Heart of Fire and This is What I Get have some party rock qualities ala early Van Halen, but still remain true to the metallic sound of the rest of the album. The title track features a rock piano fill that Riot make work very well in a metal song. The song is heavy and catchy, with the piano helping to accentuate the melodies and provide a retro (at that time) 50's or 60's flavor to the music. While this album is very heavy for its time with all the wailing guitars and pounding drumming, the songs are also very addictive in their catchiness at the same time. Riot certainly makes the most of the nine songs on this album, as none are fillers. While Riot went on to write several excellent albums in their career, the way in which they capture lighting in a bottle with this first release is often overlooked. The raw, youthful exuberance and sheer energy makes this album a unique piece of the Riot discography. Although Guy Speranza sang on Narita and Fire Down Under, the successes and praises for those albums would be different from Rock City. When a young, eager band puts it all together with a special chemistry on a debut album, it is a unique experience. Luckily, Riot have endured to this day as they have more than just the ability to catch lightning in a bottle for an excellent debut album. Mark Reale and the musicians he has surrounded himself of the years have found a way to persevere through numerous setbacks to keep the Riot name a staple of heavy metal for 30 years.